The UAE and Sudan enjoy long-standing cooperation and strategic bilateral relations and the Gulf country has provided more than Dh28 billion ($7.623 billion) in investments and development financing to Sudan. Under the leadership of the UAE President HH Sheikh Khalifa bin Zayed Al Nahyan and in line with the wise directives of HH Sheikh Mohammed bin Zayed Al Nahyan, Crown Prince of Abu Dhabi and Deputy Supreme Commander of the UAE Armed Forces, the UAE has been supporting the Sudanese government in achieving comprehensive development through financing strategic projects and encouraging diversified investments of UAE companies in Sudan, said a statement. A total of 17 UAE companies are operating in various economic sectors in Sudan, it said. Abu Dhabi Fund for Development (ADFD) is one of the leading national institutions supporting socio-economic development in Sudan through providing nearly Dh7.3 billion ($1.987 billion) in financing towards strategic development projects in various sectors, as well as investments and deposits. 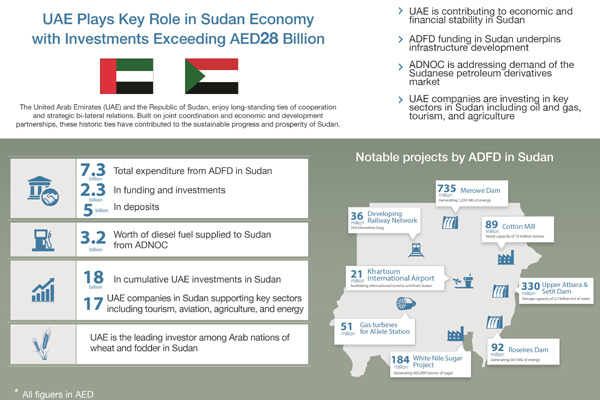 Spanning crucial sectors, such as industry, transportation, energy, water, and irrigation, ADFD’s 17 development projects in Sudan have a total value of approximately Dh2 billion ($544.5 million). Moreover, the Fund has disbursed about Dh5 billion ($1.4 billion) to support liquidity and foreign currency reserves at the Central Bank of Sudan. This assisted the Sudanese government in stimulating the economy, overcoming financial and economic challenges, and strengthening monetary and financial stability in the country. ADFD is also keen on driving economic growth through investment cooperation with the Sudanese government. The Fund currently holds a 100 per cent stake in the Al Dhabi Development Company, a multi-disciplinary holding company that aims to drive economic growth in Sudan. Praising the partnership between the Fund and the Sudanese government as a model of constructive collaboration, Mohammed Saif Al Suwaidi noted that ADFD has contributed to financing development projects that serve the most important economic sectors in Sudan. Since the commencement of its development activities in Sudan, ADFD has focused on assisting the Sudanese government in its efforts to improve the country's infrastructure – a pillar of socio-economic development, and a fundamental element in the growth and prosperity of various economic sectors. Apart from supporting Sudan's balance of payments, ADFD has adopted a holistic approach to funding projects that align with its mission to promote sustainable development in brotherly and friendly countries, and elevate standards of living. Examples include dam projects that enhance electricity generation and water supply for irrigation, the Khartoum International Airport project, and the railway network project. In addition to ADFD’s activities and within the framework of cooperation between the two countries, the Abu Dhabi National Oil Company (Adnoc) has been providing Sudan with diesel since 2017, meeting the needs of the local market and supporting various sectors including transport and industry. The value of the fuel supplied to date is estimated at Dh3.2 billion ($900 million). Moreover, with a cumulative value of more than Dh18 billion ($4.90 billion) of diversified investments, the UAE private sector also enjoys an active collaboration with its Sudanese counterpart.